We have some very exciting news this week! Our first batch of Ham Glaze is hot off the cooker and getting ready to be launched nationwide in advance of this festive season! Our Ham Glaze is a traditional recipe, made with all natural ingredients including Dungarvan Irish Stout, pineapple and cloves. It can be used as a glaze in the final stages of cooking, perfect for Christmas ham! For Stephen’s day leftovers, use the ham glaze in bacon sandwiches! This is an entirely new venture for Ballymaloe Foods and we are very excited to bring a new product into the range. Last weekend Emer and Seibhe took the Ballymaloe Buggy all the way up to Belfast, so they did! The BBC Good Food Show promised to be a fun filled foodie weekend packed with celebrity chefs, oodles of stalls and of course plenty of banter and samples at the Ballymaloe Foods stand. The 3 day event saw the Waterfront Hall in the centre of beautiful Belfast absolutely teeming with food enthusiasts both young and old! While only mere glimpses were caught of Paul Hollywood and The Hairy Bikers, the Ballymaloe Foods Two caught up with the lovely Sharon Hearne Smith. Back at HQ, Taste Cork Week was in full swing. 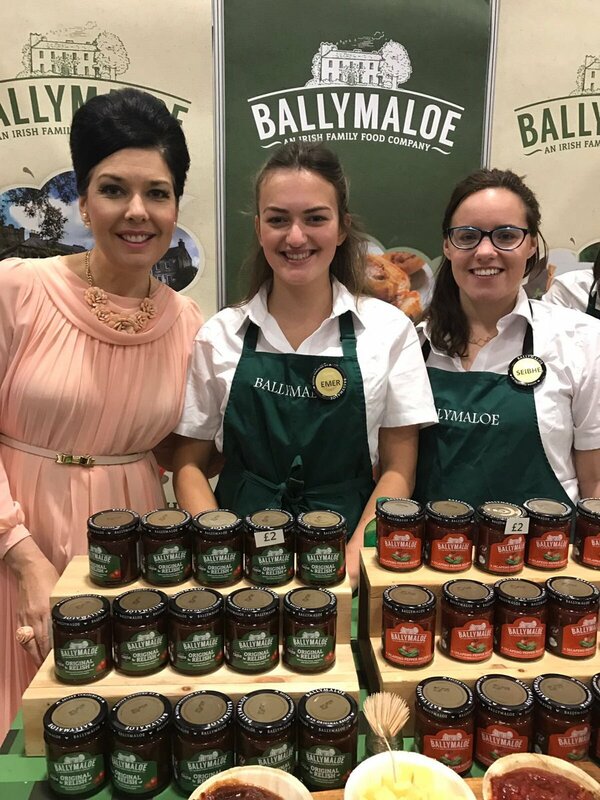 Ballymaloe Foods were right in the middle of all the activity, delivering hampers to our competition winners and jars of relish to many of the participating restaurants. Events took place in iconic Cork foodie hubs including The English Market and Ballymaloe House! Well done to all involved in Taste Cork for organising a fun filled, entertaining and educational week! The Ballybull was the order of the week in Coqbull restaurant in the heart of Cork City. Last week saw a very special addition to the menu…Using all local produce such as Smoked Gubbeen Cheese, rocket, lettuce and of course Ballymaloe Relish, the Ballybull was a huge success and one we hope to see on the menu again soon!